Today our 12 year old son made play dough (recipe below) on the Solar Burner. We learned that we should not use a wooden spoon (or at least not leave it in the pot) when it started burning. He had the same experience as I did yesterday: his sleeve starting to smoke, as he was reaching to stir the play dough. Thankfully we saw it right away, so it didn’t burn. Now we both know to be more careful, just as we would if we were using a gas burner – we would not reach across the stove without care. The play dough turned out great, and he and his brothers had fun with it. While the Burner was still out, I reheated the soup from yesterday. I used the Solar Burner on our front porch today, and I have a question. Is it possible that the parabola could shine/flash sunlight onto our neighbors while I’m cooking? I don’t think this would happen, if the focal point is pointed at a pot, but in the process of turning it and adjusting positions, I wonder if this happens? I don’t want to blind or upset anyone! Add food coloring to the water. Add to remaining ingredients and mix together. Cook over medium heat 3-5 minutes and stir occasionally until a ball forms. 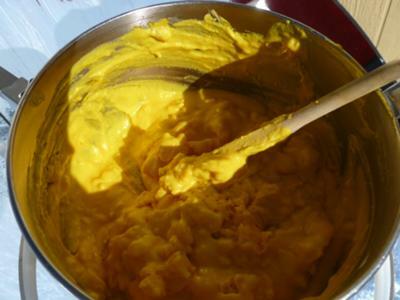 Remove from saucepan and knead for a few minutes. Store in a zip lock bag (we store ours in fridge). This play dough lasts much longer than store bought (it doesn’t dry out as fast) and the kids love it. 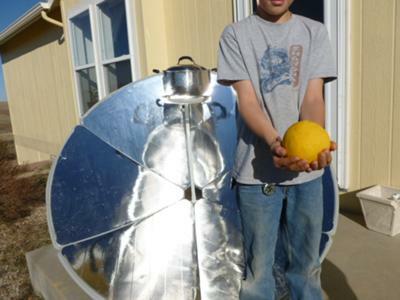 Hey, that is adventurous...Play dough on a solar cooker. I'm impressed! The reflection from the parabolic can do no harm since it is too far away from your neighbor's home and the "bright flashing" is probably no worse than that of flashes from cars and their windshields as they pass by on a sunny day. I have though used my Solar Burner to reflect more light into my home and office windows when I am not using it to cook. The "off-angle" will give you lots of extra reflected light inside of a room. Thanks for the photos, they are great!